As nature and landscape photographers (people with a deep appreciation for the natural world), experiencing unique places for the first time is highly valued. Whether it’s sheer granite cliffs glowing in the morning light or big cats of Africa, most of us have a long list of destinations we dream of visiting at least once. On the one hand, we know that we typically need to be able to enjoy the patch of earth we live in every day, but that is not the point I’m trying to make. I want to talk about what happens when we have the good fortune to make that amazing (and potentially once in a lifetime) trip. Even if we live in one of the most beautiful places on Earth, which I certainly do, feeling inspired does not always come easy, and it usually takes careful consideration for me to get myself engaged with my local landscape. At home, our daily routines can disconnect us from potential photographic subjects, but when we travel, our senses are naturally heightened. At every turn we notice something marvelous, photo worthy, fresh and captivating. Even just the hype of a great location can get our creative juices flowing, and for those reasons, I would never think less of someone for hoping to abandon their home turf for Yosemite, the Himalayas, or the Serengeti. I wasn’t out of the country (though the lower 48 does sometimes feel that far away), but I got to thinking about this topic when consecutive mornings saw me visiting three different locations in southern California. While you may not consider any of them to be undeniably iconic, they are all pretty well know, and two of the spots were brand new to me. My first morning was in the Alabama Hills, which is one of the few places that I can’t think about without having a photograph by Ansel Adams come to mind. Just like the next two days, I left my grandparent’s farm in the dark of night for a long drive and had very little idea precisely where I would end up. In a place I thought was going to be about rock and mountains, my favorite part of that excursion ended up being the joy of stumbling upon spring flowers and a variety of other really interesting vegetation. Before I could even begin to think about the beautiful plants though, I had to set up the camera with a wide angle lens and wait for the sunrise to touch the distant peaks. I truly felt that I HAD to, and that is what I mean by the “pressure” of travel photography. In a single morning, I wanted to make photographs that I could hold up next to all the many hundreds I had seen from these locations and feel proud of them. How can creativity survive under demands like that? First of all, we’ve all had experiences where the do-or-die atmosphere only serves to make us more deliberate in experiencing each moment. Pressure to perform doesn’t have to be a bad thing, but I still try to temper it as much as possible. While I’m being more conscious of every moment, I try to remind myself that recognition of the beauty and wonder is more important than the record. The info in the margins of the viewfinder really doesn’t add anything to the scene, so I do my very best to fight any urge to skip past the present and think about admiring future photographic prints. 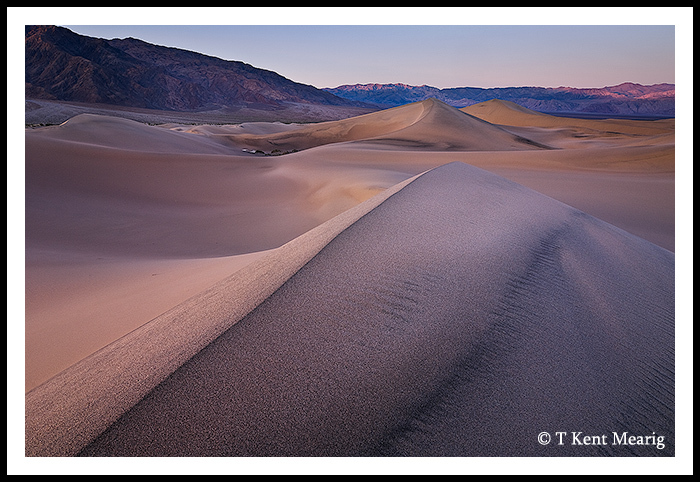 After a relatively shorter middle trip to Joshua Tree National Park, I was ready for the longest drive to my most highly anticipated location, Death Valley. 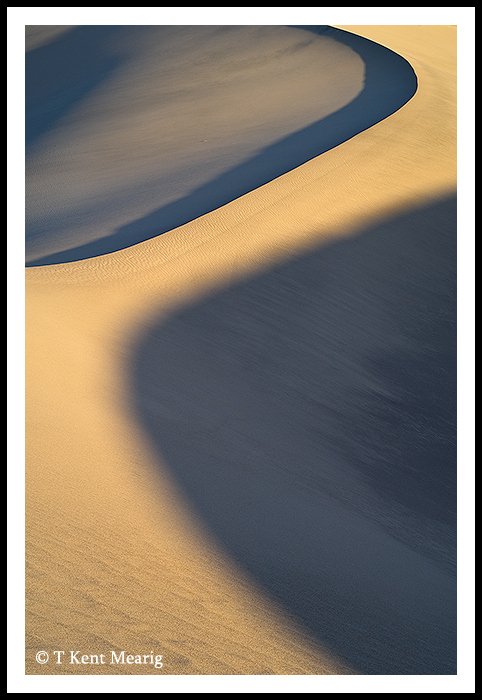 I was surprised that all the lofty goals I had for sunrise on the Mesquite Dunes didn’t really get in my way at all. Arriving so early that I could see the stars more clearly than any land form definitely helped. 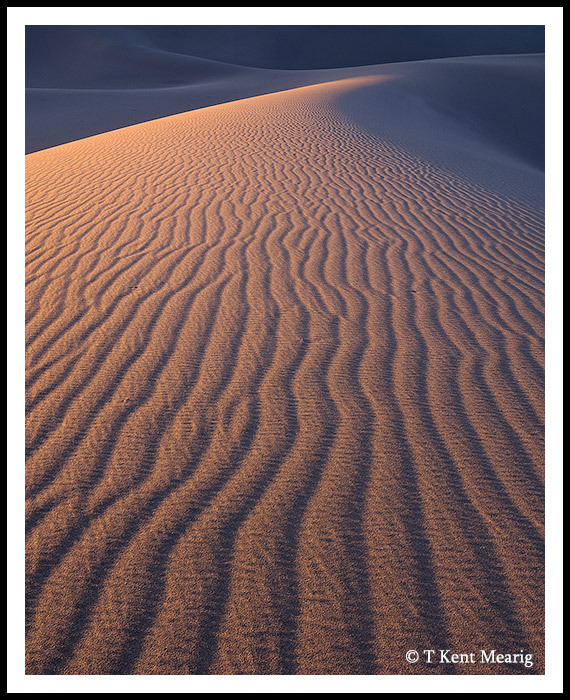 At first, I couldn’t even believe the sign that said “Sand Dunes” with an arrow pointing to apparently empty darkness. 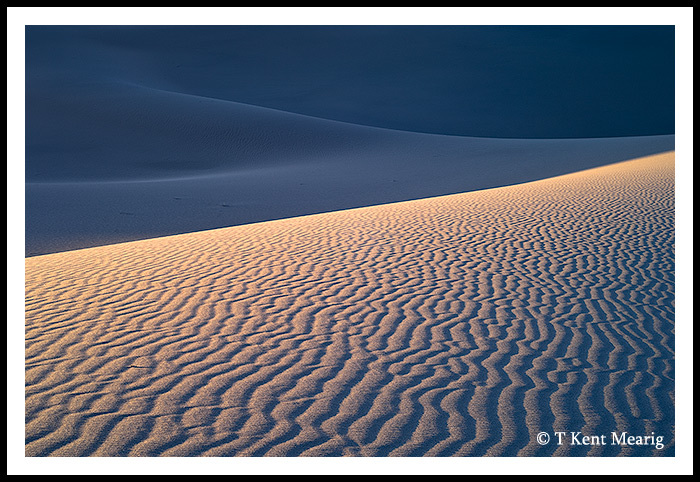 I had plenty of time to wander over the dunes in pre-dawn with my dad looking for the perfect place to set up first, but what helped the most was that the first image was not what I had come for. 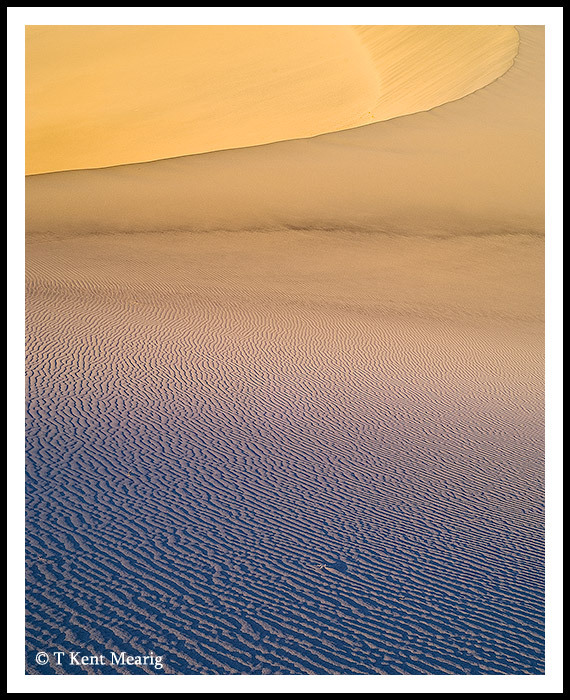 The thing I longed to record was the way the light would interact with the ripples, arcs, and ridges of the dunes themselves when the sun had just barely cleared the horizon. Not being able to anticipate (and not trying to) that interaction is what set me free. When you’re in a landscape like none you’ve ever experienced before, your photography had best be about reaction and not anticipation. After all, isn’t it impossible to anticipate things with which you are not familiar, and isn’t your reaction what you desire to share through photography. I think I learned some valuable lessons on those three fantastic mornings, and I hope I put that learning to good use when I next find myself with a beautiful new world in front of me. Thanks for letting my share my thoughts and photos, and may God bless you with good light. Every one of these = excellent! Love the side lighting and great shadows. The sweeping lines really carry my eyes through each frame very well. Great job!